Resurrecting the Wood | "A limb once amputated is dead but nature has an uncanny way to compensate…….."
"A limb once amputated is dead but nature has an uncanny way to compensate…….."
The drive to Bishop was uneventful, the same drive we do each year, the same scenery but just a little dryer. We had finally got away from Big Bear by 10:00 am. The traffic was flowing nicely with none of the congestion that we normally encounter, most likely from people still nursing hangovers or eating breakfast from the previous nights celebrations. We had taken the back route from Big Bear, taking California State Route 18 through the Lucerne Valley on to Apple Valley, through Victorville and dog legged over to U.S. Highway 395. The day had started off with clear blue skies with a little wispy cloud but as we traveled northwards the cloud was generally thickening up. Over the Sierra Nevada the thick cloud was evident, there was little or no sign of snow pack, long gone from the continuous melt from the record dry seasons, from the previous four years. Watching the cloud build, we were all wondering at what level the alpine lakes would be and would the fishing be of the same quality that we had become accustomed to. Staying up in Big Bear on the 4th July provided some reprieve from the fireworks that we usually get at our home. We traveled there soon after the Huntington Beach Parade, taking all backpacking gear, the dogs and our tired feet. Thankfully all the packing had been done previously, all we hoped for was a clear run without any drama on the freeway. The 4th July weekend always offers its challenges, fireworks create mayhem with our dogs especially as they are now legal again in Huntington Beach. 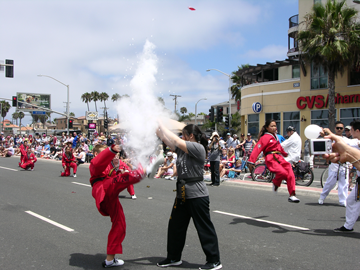 We had started the day with an early rise as both children were representing Victory Martial Arts in the Huntington Beach Parade as part of the Demo Team. The overcast day was a reprieve from the searing heat of most 4th July Parades we have walked, especially as we were in the last quarter of the participants. Marching, co-ordination of moves and balloon breaking entertained the crowd as we worked our way along Pacific Coast Highway and then down Main Street. Too much to do and little time to do it, seems to be my everyday existence. The kids are growing, so is the amount of traffic and projects are mounting up at an alarming rate. The blog has taken a back seat and so has my clay modeling website but I will have to try and get some of it done. I had noticed that all the posts had disappeared, I was at an impasse, what had happened. I at first could not work out what had gone wrong, and knowing I was running out of date WordPress script with an outdated theme didn’t help. My first job was to update to the latest code and theme to see if this would resolve the problem, still no luck, did I install the code properly had I missed some of the script? OK, uninstall and redo, still no luck. This is where I have to start searching the internet and the WordPress forum to find out if other people were having the same issue. Most young girls have heard of an American Girl Doll or even own one and once purchased the inevitable catalog will find its way to your mail box. This is what happens in our household and of course our daughter likes to see what new clothing and furniture is available. She always gravitates to the beds and bedding and once asked “What do you like,” she replies, “An American Girl Doll bed,” so that Julie had somewhere to sleep. Julie is her American Girl Doll, so my first step was to check the website and find out what price we were looking at and if there were by any chance, a sale going on. Further research showed the price was in the range of $125.00 with bedding, I liked what I saw but I felt that the quality, though good, was very basic, and for me a nice woodworking project! I said to my daughter, “Would you be interested if I made the bed for Julie?” And with a sparkle in her eye she said “Only if it is can be like my bed!” I already had the basic sizes that were given in the catalog to give me a general feel for what I was taking on, but I decided to measure my daughters bed anyway, to compare sizes. The bed in quarter scale came very close to the manufactured beds in the catalog so using these two sets of dimensions I set out to find suitable wood to start the project. It’s been a long time since I’ve posted an article mainly because of being mentally drained from excessive driving on one of the most congestive motorway systems in the world, Los Angeles, but that’s really no excuse, so having said that, I just need to dig in and post! One of the latest carvings that I’ve embarked upon was a combination of designs that I had made for various people. I wanted to reuse some of the elements to provide the basis of this new lovespoon. In this particular design I had previously developed a twenty fifth wedding anniversary lovespoon that also had roses and hearts surrounding the pair of hearts. The center heart had the number twenty five carved internally so with that basic image I decided to eliminate quite a few of the elements to get back to basics to provide the foundation for this lovespoon. One of the favorite elements for my lovespoons is a flame design that adorns the top, this adds an attractive end to the carving and also provides a way of displaying the carving by way of hanging it on the wall or in a cabinet, so with that in mind that was where I would start, that was a given. The spoon end would be in a heart shape as this always carves nicely and gives a good balance to the flame at the opposite end. The Celtic theme would be displayed by the Celtic knotwork that would extend from the spoon bowl, leaving just the pair of hearts to nestle between the flame and the Celtic knotwork. With the theme completely worked out, the tracing was transfered to the basswood blank ready to embark on carving out the shape. My first job is to drill each corner with a 1/16 inch drill bit so as to be able to fit the blade of my fret saw and to create a clean cut in those awkward areas. I had given up with using a power fret saw a long time ago, much of the time was wasted on breaking blades and continually threading the blade into small areas. Most of my designs would amount to little sawing in a lot of areas so I’ve opted to using a manual fret saw. I find that during the process of cutting out the design I can work out in my mind how I will carve certain areas and how I will resolve any mishaps if they should occur. With the blank set up in the woodworkers vise a steady sawing motion eventually cuts out the excess stock leaving just the outside shape to be cut on the bandsaw. With all the profile cut, now was the time to get comfortable and sit with carving gouges, chisels and sanding blocks around my oversize bench hook and carve away at the spoon bowl. Next would be the back of the spoon and then onto the Celtic knotwork. A methodical process that eventually takes that flat piece of timber and turns it into a three dimensional, visually pleasing piece of art. The Jimmy Kim Invitational Tae Kwon Do Championship at the Walter Pyramid had seen the end of the Poomse part of the program and we were deep into our sons sparring where he had gone two, one minute rounds with the score cards at two points a piece. His opponent was a red belt and Jackson at present was a brown belt, theoretically this should give his opponent the edge with the more experience. Victory Tae Kwon Do club starts their students sparring at the point when they reach orange belt status so if this is the same for most clubs his opponent would have four to six months additional experience with sparring even though their ages would be very close to each other. For Jackson to gain a win he would have to be quick on his toes and mindful of what his opponent was up to. With the first part of the JKI tournament under his belt Jackson was now in a waiting game until his group number would once again be displayed. We could tell by his uneasiness that this was the one part of the competition that he was most nervous about. The display board highlighted group numbers 300 through 307 and with his at 346, there would be a while to go before he’ll make his way down to the holding area. We decided to watch several sessions of the sparring to see how quickly they would call the group numbers, then knowing the time lapse we found it an ideal time to get something to eat and drink and at the same time it would reduce the stress level for both him and us. The usual selection of event food was available so we opted for the pizza with Gatorade which would give him energy when the time comes. The last weekend of September was a major event for our son Jackson, it was his first Jimmy Kim Invitational Tae Kwon Do Championship at Long Beach. This annual event takes place at the California State University, Long Beach at the Walter Pyramid, this was its 20th year. He had gone last year just to see what the expectations would be and it had left a lasting impression on his young mind, for one he had only been at the club for a total of 4 months and he was a yellow belt. He had watched the Poomse part of the competition but once the sparring started that was when the image left a lasting imprint on his mind. The black belt competitors had been super aggressive and it had frightened him to the extent of never wanting to compete in that part of the program. In my previous post I had completed the job of cutting back the soil to four inches below the previous level leaving plenty of room for a good rock base that would allow rainfall to drain away easily. 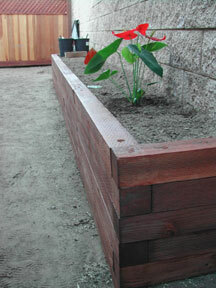 My focus now was on purchasing the supplies to construct the raised planter bed. I had calculated that I would need a total of twenty lengths of 4″ x 4″ x 8′ pretreated lumber and twelve lengths of half inch by six foot rebar. The rebar would be cut in to three to provide two foot lengths to pin the lumber in to place. I already had a spare can of the green wood preserve so I’m going to use that up first before purchasing anymore, afterall it was my mother-in-laws budget and I was trying to get the job done at the best price possible. As far as my labor cost, that’s a no brainer, that’s traded off by looking after the children! Once complete there will be some kind of oil based stain that will cover the whole construction but the tone or color can be decided upon later. With the materials in tow and a selection of power tools, chop saw, electric drill and numerous hand tools my first job was to map out the boundary of the planter box. The patch of land behind the mobile home was pie shaped to a certain degree meaning that the planter box could be slightly wedged shaped so as to reduced the effect of the angle on the remaining land between the mobile home and the planter box. I needed to know to what degree the angle would be and the person best qualified to decide that would be my mother-in-law, afterall when all is complete she would have to live with the end result. Mehreen Ahmed on Jacaranda Blues!!! bicycles on Beach Cruiser goes Global! !